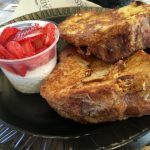 King's french toast is made with King's bakery bread. This bread was originally in Hawaii but since they have become more popular, they're all over. It's a wonderfully soft and deliciously sweet and it makes the most decadent French toast on the planet!Note: You can change the number of people served by placing your cursor over "Servings". The Ingredients will adjust to the new number of servings. Mix eggs, sugar, salt, nutmeg and half & half. Pour mixture into a flat, shaped dish. Place bread slices in mixture just long enough to thoroughly coat the slices. Note: Do not completely soak the bread in mixture as the bread is very soft and absorbent and will not cook all the way through if soaked. Transfer to a buttered skillet over moderate heat and brown well, turning once with a spatula. Serve hot with butter, preserves or syrup. Bacon or breakfast sausage goes great with this dish. Yes, the Kings bread is very soft and I can see that happening. I’ll have to edit the recipe with the note not to soak too long! Thanks for the heads-up on that…enjoy your sunshine. Aloha!